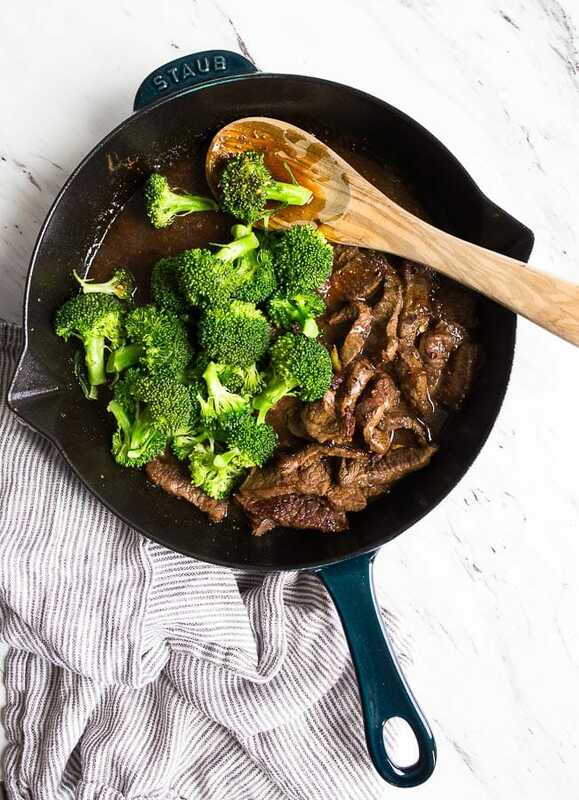 Beef and broccoli stir fry for two–all made in one pan. Just add rice or noodles and serve this easy skillet beef dinner for two! We’re going through a major take-out phase in our house. Schedules are packed, time is tight, and dinner needs to fit in one bowl. Plus, it needs to come together super speedy! Enter my beef and broccoli stir fry, stage right! For a dinner to hit my table fast, it not only has to be easy, but it has to be made all in one skillet! 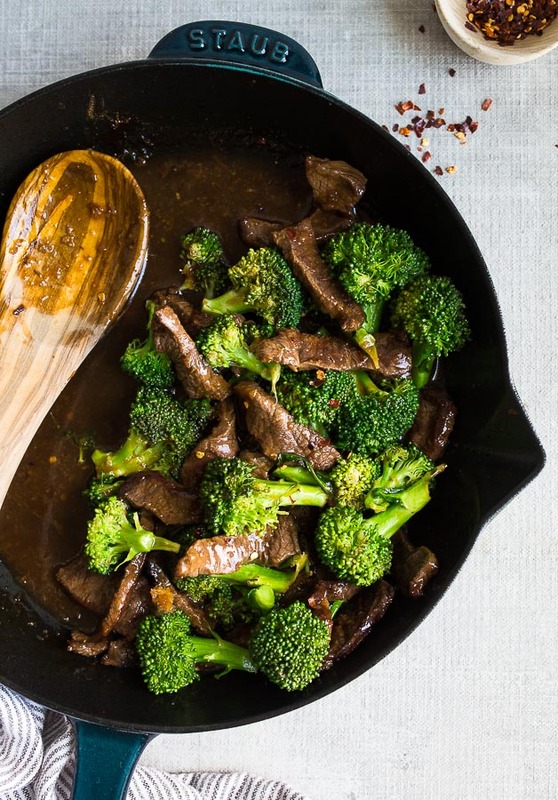 This stir fry cooks the broccoli and beef right in the same pan. 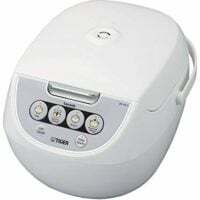 Though, you will have to cook rice separately, or you could buy frozen rice and heat it in the microwave, like I do most of the time! I typically use frozen brown rice when I make this for our lunches for the week. You guys really seem to love my honey garlic chicken thighs, and I’m guessing that’s because it bakes on one sheet pan in the oven! That recipe does require a pre-fry step of coating the chicken in cornstarch and egg, but after that, everything bakes together on one pan. 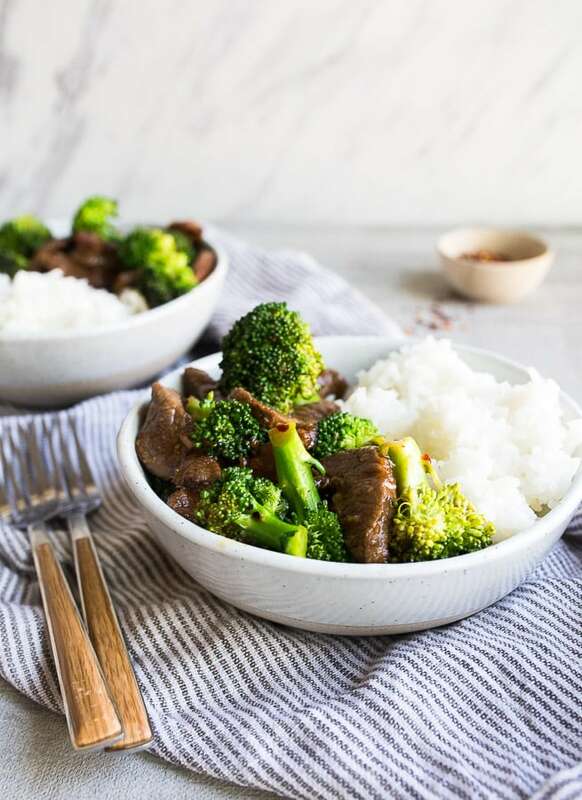 This beef and broccoli stir fry is even easier–just cook the beef, add the broccoli, stir in the sauce and serve! 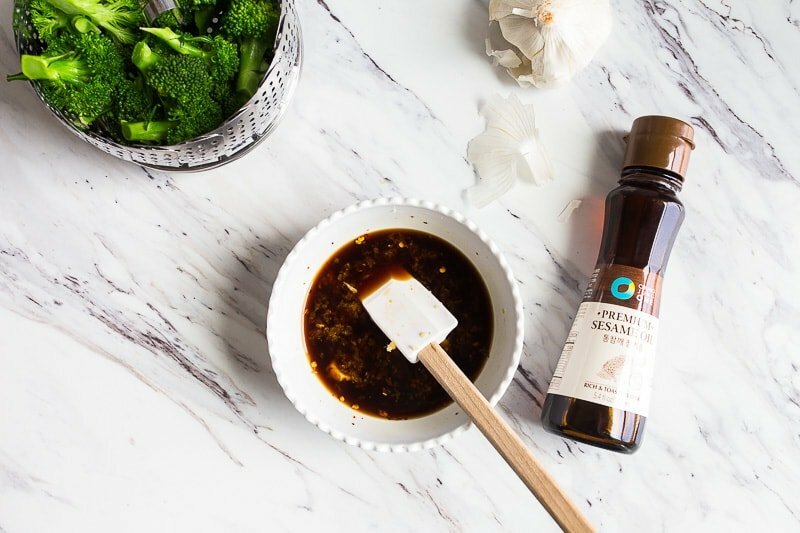 While the beef and broccoli are sizzling in the skillet, we’ll whisk together our sauce. The sauce is sticky, sweet, spicy, and salty all at once. Basically, it’s addicting–you’ll want to double it and pour the extra over rice. Let’s talk about cornstarch, because we’re going to use it twice in this recipe. And in this recipe, it actually has two different applications. First, we’re going to coat the thinly sliced beef in cornstarch before frying it in the skillet, because it helps create a crispy crust. The starch clings to the meat and allows it to become extra brown and crispy. Check the how-to video for this recipe to see the cornstarch in action–so much crust on the beef! Second, we’re using cornstarch to thicken the stir fry sauce. The only rules you have to remember with cornstarch is that it must be fully dissolved in cold liquid before using. Whisk cornstarch into your sauce ingredients, and then pour it in the pan to heat up. When cornstarch hits a hot pan, the protein coagulate and thicken the sauce. But if you add cornstarch to a hot pan, it will clump. Fully dissolve it in cold liquid first, please! 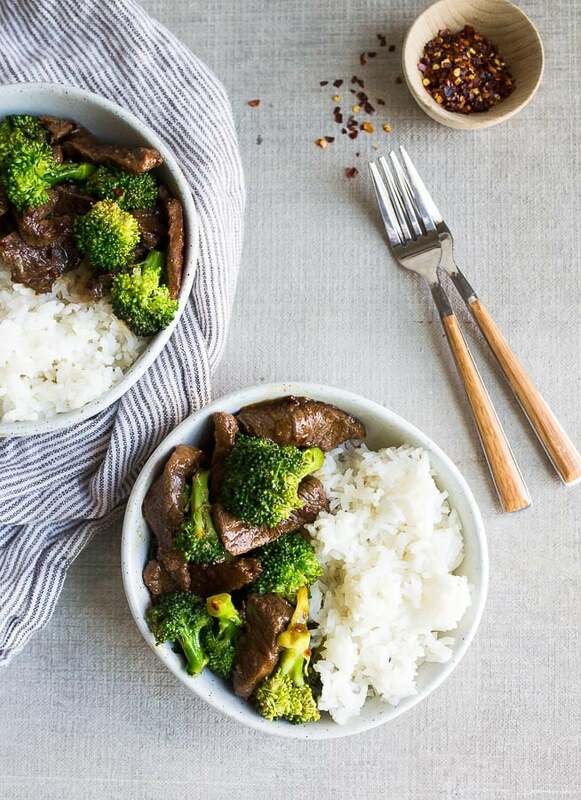 When making this beef and broccoli stir fry, the freezer is your friend! 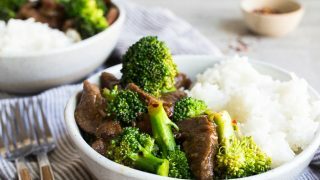 You can use frozen broccoli florets or fresh broccoli that you chop into bite-size pieces. Also, before attempting to slice the meat against the grain, try freezing it for 20 minutes first. I find that beef is slightly firmer and easier to cut against the grain. I successfully use both flank steak and skirt steak for this recipe. While I slightly prefer skirt steak, use whatever you can find or whatever has a great price at the store. Before slicing the meat, use your eyes to find the lines in the meat. Then, cut opposite of those lines–this is how you cut against the grain. Please see the video at the top of the post for further instructions on this. If you’ve been around this site for a while, you’ll notice that everything is portioned for two people. So yes, this beef and broccoli serves two very generously. When we make this, we usually have a small portion for lunch leftover; but for the most part, my recipes make just two servings. That said, you can absolutely double this recipe and cook this recipe in a larger skillet to feed 4-6 people. We love the broccoli slightly crunchy, so we add it after the beef sears on the first side. If you like the broccoli a little softer, add it at the same time as the beef, your choice! You can even slightly blanch the broccoli before hand. Frozen broccoli florets are a little smaller than fresh-cut, so they may cook quicker. If you make this recipe and love it, let me know! I’ll keep the better than takeout recipes coming, because you guys really seem to love them! 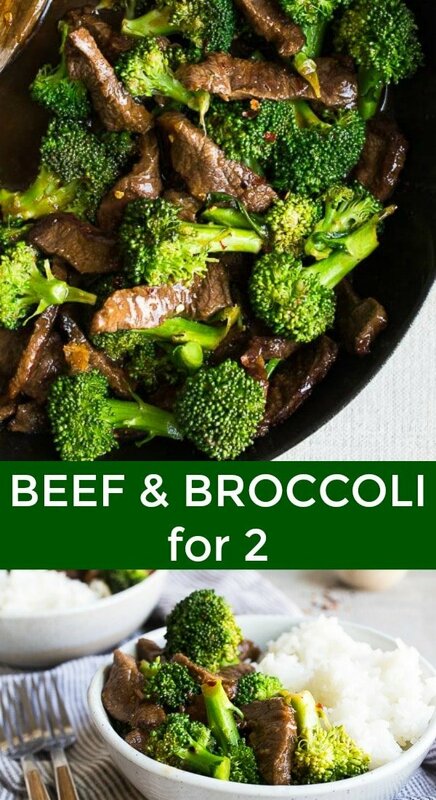 Beef and broccoli stir fry for two. Made in just minutes, all in one skillet! Place the beef uncovered in the freezer for 20 minutes to firm it up slightly. Find the grain in the beef, and then slice the opposite direction. See video for reference if you need help with this. Toss the sliced beef with one tablespoon of the cornstarch in a bowl, and set aside. Next, whisk together all of the sauce ingredients: the soy sauce, chicken stock, red pepper flakes (if using), minced garlic, grated ginger and honey. Add the remaining tablespoon of cornstarch, and whisk very well to combine. Set aside. 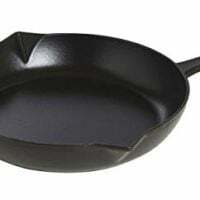 Preheat a large 10" skillet over medium high heat. 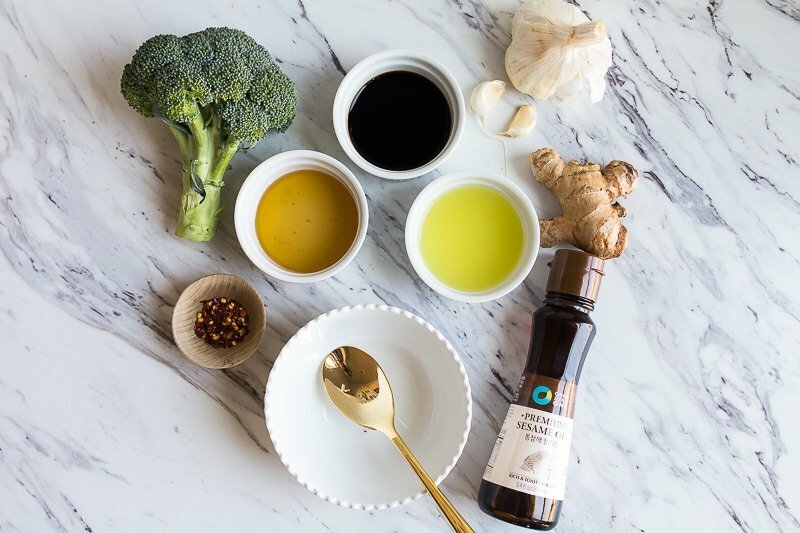 Add the tablespoon of oil, and allow it to heat until it shimmers, about 3-5 minutes. Add the meat to the pan in a single layer, and allow it cook on the first side until crispy and brown. Flip the meat to the other side, and add the broccoli florets to the pan. Finally, stir in the sauce and let it bubble and thicken while the beef finishes cooking, about 5 minutes. Divide the mixture over two bowls of freshly cooked hot rice and serve. *Skirt and flank steak is often sold in 1-pound cuts; have your butcher cut it in half for you, or cut it in half at home and freeze the remaining portion for another dinner. I am commenting here because I don’t see a place on the site where my comment belongs. Sorry. Anyway, I signed up, twice, to get email alerts for new recipes. There seem to be new recipes, but I have not received any email alerts. Am I misunderstanding this format?